"Wait!!! Please do not call a pest control company before you know if they are a swarm of honeybees or indeed hornets. 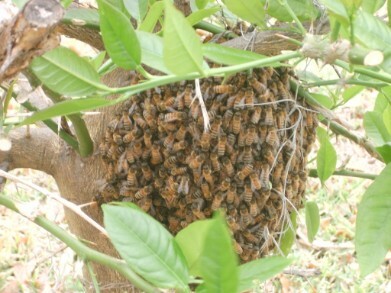 If they are honeybees and are swarming, they will leave in a few days. I had a swarm in my yard and called an apiary (Wallace Family Apiary in New Mexico ->. They came and collected the bees. I helped. They were so gentle that you could handle them. I was amazed that I could touch them. Mr Wallace gave them a new home and they are thriving. Please, everyone..honeybees are essential in our world and are in grave danger. If you have a honeybee nest or swarm, please call a bee keeper..not a pest control company. The pest control company will almost certainly poison them".